Everyone is welcome in Oksana Piven's beautiful jewelry shop. You can find one of a kind handmade jewelry here made from polymer clay, beads, wire and so much more. Oksana is putting her heart and soul in every creation and she believes that people who wear it will be really happy! My name is Oksana and I was born and raised in Ukraine. I have a husband and a 16-year-old daughter. Another VIP in our family is our cat! I have a PhD in molecular genetics and I work as a senior scientific researcher at the Institute of Molecular Biology and Genetics. - How long have you been creating? As a child, I was enjoying my art classes at the Children's Fine Arts School. I was creating things in different styles and materials. My parents supported my creative explorations and interests in crocheting, knitting, painting and other types of crafts. They kept all paintings made by me at the child's age! When I was a teenager I discovered macramé. This technique was new for me so I took some classes and filled our home with the variety of new panels and planters. 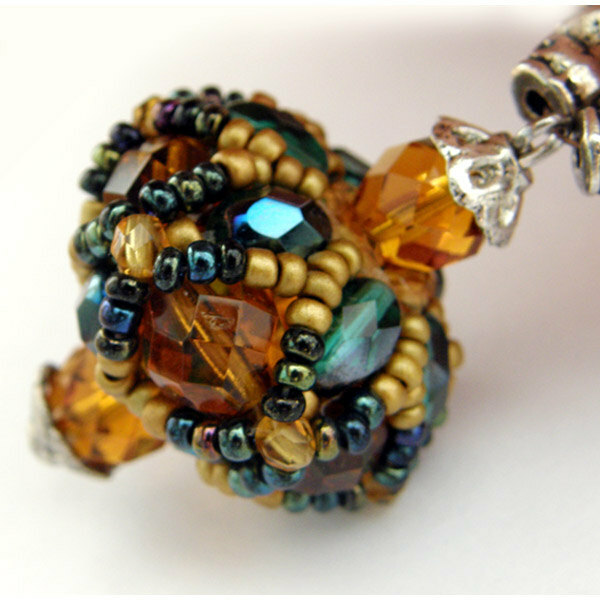 My current passion – jewelry making – started a few years ago. I'm thankful to the Internet and my friend who introduced me to the polymer and seed beads community on the Internet. At first I tried myself in seed beads and faceted beads techniques – I beaded beads and created necklaces with them. I enjoyed doing it and the process fascinated me. 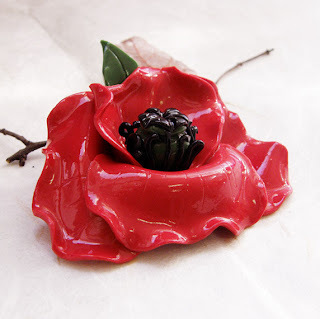 When I discovered polymer clay and the possibilities of this material I liked it very much. I try new techniques all the time, for example, I try to use polymer clay and other materials together. - What items do you carry in your shop? In my shop you can find statement necklaces and lovely pendants to wear every day. I work with a variety of techniques. I like use the texture on clay technique in my jewelry, as well as hand-sculpting and molding techniques. 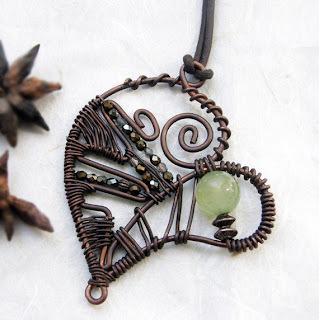 I like to create jewelry from natural materials or metal imitation techniques. I am fascinated with the process of jewelry making. And beauty is a very important criterion for me. Jewelry should be beautiful and harmonious, and certainly interesting! I am sure that the value of handmade is in the originality and uniqueness and I try to show it in my works. - What inspires you and what does the day in your studio look like? My inspiration comes mostly from nature. I love to use flowers or leaves as ornaments. Also I like folk ornaments, ethnic jewelry and trade beads. I collect pictures of Ukrainian jewelry, folk and modern, and I enjoy discovering it. In my creations I try to mix the traditional folk style and new materials. - Do you use any special techniques or tools? Of course, I use different kinds of materials and tools: pasta machine, cutters, textures, paints and inks and so on. Moreover, sometimes I use the spices, salt, brushes, leaves, pieces of tree bark - anything I find useful. 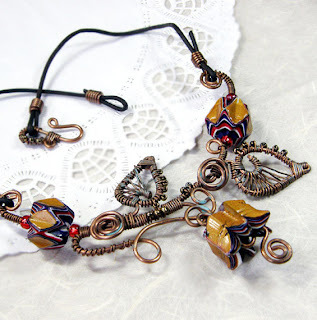 I simply love the unique jewelry pieces Oksana creates! The copper heart is so unique and beautiful! Oksana, this is a lovely article! Beautiful jewelry! Nice to meet you! I love your work!